8 November 2017, at 12:01a.m. ANALYSIS - Oral fluid sampling is growing in popularity around the world. New research is showing an even easier way to extract and ship the sample. Thermo Fisher Scientific conducted a study about oral fluids and sample extraction using the GenoTube sample collection device. "Normally, for oral fluid transportation, it's very important to have the shipment at 4°C which requires a cold pack or refrigerator pack in with the shipment to maintain good results," said Aurore Blanc, Senior R&D Technician at Thermo Fisher Scientific in France. "Our research shows that the GenoTube special swab permits you to ship and store at room temperature, which simplifies life and it's really easy to use." 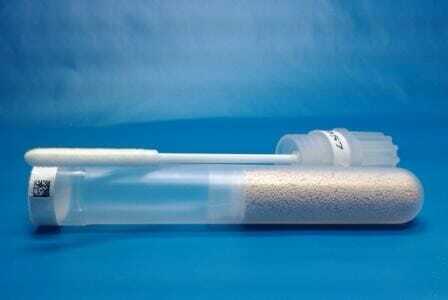 The GenoTube allows easy sample collection and fast drying due to a special desiccant. The study compared three different types of GenoTubes - Livestock, Evidence and Spuren. These were compared to determine which would be best for recovery of pathogen RNA from oral fluid samples. The study concluded that after the swab is placed back in the tube, the sample is dried within two hours, which is important for stabilization of the nucleic acid in the sample. The tube can then be transported and stored under normal storage conditions (room temperature) without refrigeration. The amount of nucleic acid is sufficient for testing with real time PCR. The stability study showed that samples stored in the GenoTube remain fairly stable for up to 5 days and the sensitivity (#of positive vs. negative calls) remains intact. Based on the data, the best GenoTube type for transport and storage of oral fluids is the Livestock GenoTube. You can view the full research poster by clicking here.